Study and understand stored potential, capacitance, and energy conversion. 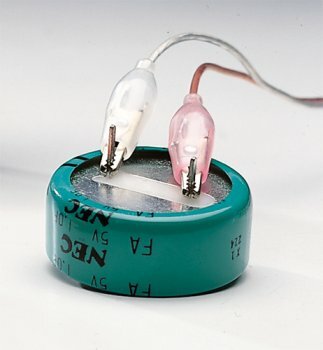 Genecon's (P6-2631) output can be stored temporarily in this unique miniature capacitor, then tapped to perform various short-term tasks. The capacitor uses revolutionary electrochemical technology to pack what would have been a roomful of equipment into one palm-sized disk. Rated at 5 volts, 1 Farad.